During a recent trip to our home state of Michigan, we made a point of stocking up on all our favorite Amish goodies. Since relocating to Western North Carolina a few months back we have been unable to find the same prices on some of the quality items we used to purchase in bulk from our favorite Amish farmers. This has led us to ration our soap, cheese, maple syrup, and raw honey like a depression-era family. Finally with our pantry re-stocked, along with a few new items we’ve been searching for, we should be able to survive the next few months. Check out some of our favorite Amish-made goods and some unexpected new finds that made us smile. The quality of our soap is important to us. It’s lathered all over our skin – our largest organ. We are dedicated to using products on our skin that don’t contain harsh ingredients, so we’re willing to spend a little extra to avoid commercial brands that might be damaging to our bodies. 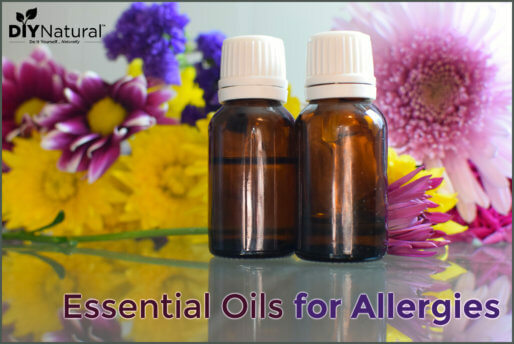 You may be interested in reading this article to learn more about ingredients we avoid. During our Michigan trip, we visited an indoor Farmer’s Market to see our Amish farmer and friend Wilbur, who also sells fabulous handmade soaps. We bought nine bars of natural goat’s milk soap in scents like vanilla, citronella, rosemary, oatmeal lavender, and cinnamon. These should last us months (and will buy us some more time to find reasonably priced natural soaps in our neck of the woods or begin making our own). On day 4 of our trip Matt returned from a bulk Amish store in Mio, Michigan with the ungodly pile of cheese you see above. (Let me remind you there are only two people in our house.) 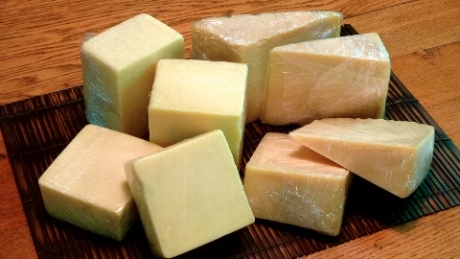 Parmesan cheese for grating over pastas, soups, salads, steamed veggies and popcorn, and sharp white cheddar for his crackers, sandwiches, and burgers. I was excited to see the awesome price on the fresh parm. We have been buying it at a local health food store for a steep price and it was beginning to break the bank! We are always looking for healthier alternatives to sugar. We frequently sweeten our baked goods, smoothies, tea, and other items with raw honey or maple syrup. Matt found a 6 lb. bucket of raw honey at the bulk Amish store for only $17. If you have ever priced out raw honey this is an extremely good deal. We purchase raw honey because it is less processed, allowing it to retain all of its health benefits. Did you know it is the only food that never spoils? We also purchase crazy amounts of pure maple syrup from our Amish farmer. It tastes a million times better than Mrs. Butterworth’s, and does not contain high fructose corn syrup like most commercially prepared maple syrups. 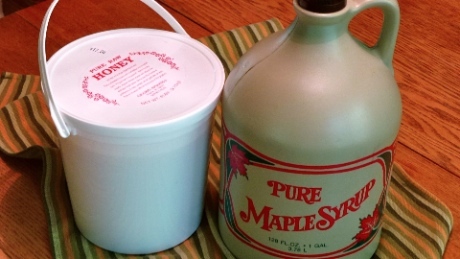 We purchase it by the gallon, which sets us back $47… again, a very good deal if you’re talking about pure maple syrup. We mostly use it to sweeten homemade granola, and of course it makes the occasional stack of pancakes or french toast taste delectable. Cooking from scratch requires a fully stocked spice cupboard. We are frequently running out of spices, so we like to have extras on hand. Let’s dispel a nasty rumor about spices right now–spices do not spoil, but they do lose strength over time. Whole spices will retain potency for about 4 years, 2 to 3 years for ground spices, and about 1 to 3 years for leafy herbs. So don’t throw out all your spices every 6 months! You can continue using them as long as they still have flavor. 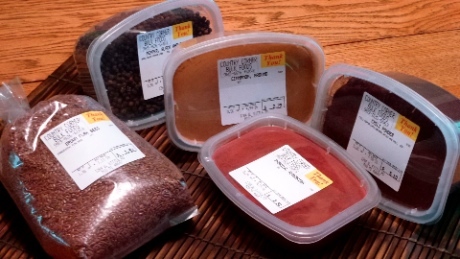 Matt found great prices on some of the spices we use regularly, including whole black peppercorns, ground cinnamon, chili powder, and Hungarian paprika. He also picked up a bag of flax seeds at a great price. These little power-packed seeds make a regular appearance in our homemade granola, smoothies, and cookies. For a few years now, we have been on a mission to replace plastics in our kitchen. Even though many plastic products are now made BPA free, we believe plastics are not the safest choice for food storage and preparation. We have slowly been replacing plastic utensils and containers with glass, cast iron, stainless steel, bamboo, and other more natural materials. 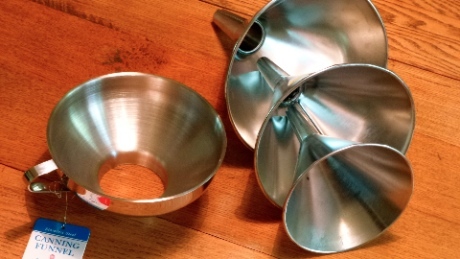 Matt was ecstatic that he finally found a stainless steel canning funnel and a set of metal funnels for our kitchen after looking for more than a year. Now when we are canning, we won’t have to worry about the plastic funnels adding anything unnatural to the food we are taking great care to preserve. These aren’t made by the Amish, but we found them at an Amish supply store. We had a wonderful trip to Michigan, meeting the newest member of our extended family and catching up with the rest of our family. All our cheap, healthy, Amish goodies were an added bonus to an already fabulous visit! What about you? Do you have thriving Amish communities near you that are producing awesome goods to sell? What are some of your favorite things? There were actually 2 stores Matt purchased all these goodies from. Both are located in Mio, Michigan. The bulk food store is on Kittles road, off M-33, about a mile or so northwest of town, and the Pioneer General Store is right on M-33 a couple miles north of town. I agree that there are many puppy mills in Amish country but that does not mean that all Amish should be condemned for it. There are bad apples in all groups and we shouldn’t generalize. The AMISH have a DIRTY little secret! Some of the WORST PUPPY MILLS ever.!! !…If you do not believe me… research it! I would NEVER buy anything from them! Two things. First, that pile of ungodly cheese? It was made by the Amish, so chances are good it was very Godly. 🙂 Second, you talked about the pure maple syrup tasting tons better than Mrs. Butterworth, and I totally agree! But I was flabbergasted on one of my last trips to the store (which has sparked us buying only pure maple syrup) to find that the one I decided to buy was the ONLY one on the shelf (besides the store’s generic equivalent) that was actually truly MAPLE. I hadn’t noticed that all the other brands of syrup were no longer called “maple”…they all said “table syrup” or “pancake syrup” or simply just “syrup”! That was an eye-opener for me. It might be $7 a bottle, but I’m not buying that fake gel-ish syrup anymore. Lol! Your cheese comment made me laugh. 🙂 And you’re absolutely right about the maple syrup issue… commercial brands contain so much high fructose corn syrup or other ingredients that they hardly qualify as syrup! Pitiful. Good luck in your search for nearby Amish stores…they’re a real treat to have access to. Howbout that – read the article this week and find out at the farmers market that my aunt-in-law keeps bee hives on her property. If you have a dehydrator, put the honey in a container, and put that into the dehydrator for 2 – 3 hours at 110 degrees it until no crystals remain. It will not affect the taste or nutritional value of the honey and it will be good as new. Hope that helps! How do you keep your honey from forming crystals? I have heated mine in the microwave to get rid of them but as soon as it cools it forms more crystals. We love honey but I am afraid to buy it in bulk. We have never had that issue with raw honey. Why would you put raw honey in the microwave? Microwaves destroy the nutrition in foods negating the very reason to buy raw honey and it changes the chemical structure of food. Put it in the sink with very hot water or you can put it in a pan on the stove and GENTLY heat it but don’t put food in the microwave. I don’t think Viola was using raw honey… probably pasteurized. Pasteurized or not, if it’s nuked, it’s not worth eating. We are fortunate to live amongst a nice size Amish community and always look forward to the growing season when they have vegetable stands with an abundant amount of fresh vegetables. Just a few miles from our home is the Cheese house where we get fresh cheese and at a much better price than processed cheese at the grocery store. Please check out http://www.farmcountrycheese.com as they also package and ship cheese. You might like all the variety they have in cheese. My husband and I live in southern Maryland and have several Amish communities near us. I do like to shop for bulk foods/spices and am still looking for that type shop in our area. I do shop at the Amish farmers market near us and am quite happy that it is open for the season. 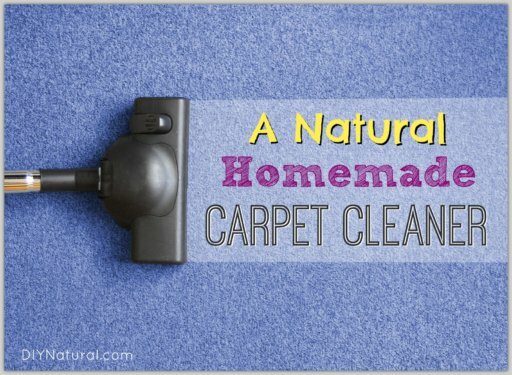 Thanks for all the advice on naturally cooking and cleaning. 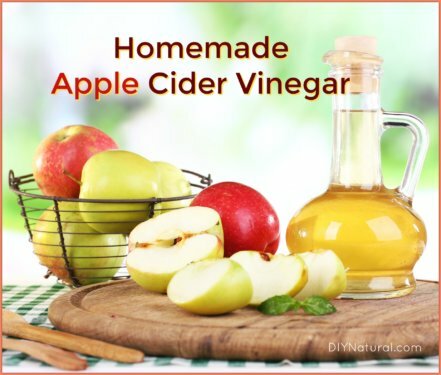 I purchased your book DIY Natural Household Cleaners and have a couple of questions…..1) is sweet orange essential oil the same as orange essential oil? I haven’t been able to find the sweet orange oil. 2) What brand/type of natural concentrated cleaner do you suggest for the shower spray cleaner? I asked these questions at the local natural food store and they weren’t sure of the answers so appreciate any help you can offer. SO jealous of you guys! I used to go through Mio all the time as a kid on my way to Camp Barakel in Fairview (a few miles to the east). We’re adjusting to a new life in PA at the moment and will be working on naturalizing our cooking and living, much with your advice. Thanks for all your work! Thanks for your support Greg! Whoa! Small world! Can you send me her name? I wonder if we were ever there together (I worked a few summers a while back). Since we don’t know you we’re not comfortable doing that. I’m sure you understand. God bless Greg. If you think of it, feel free to ask her if she knows me…certainly love that place and wish I could get up there more often! This is probably THE thing that makes me wish I lived in the US! The Amish! We’re in Australia. I don’t know of any other similar places where we can get things like the Amish sell/offer. I’ve been told that you can hire an Amish midwife for $400. A midwife here is at least $4,000! Aluminum isn’t good and stainless steel must be of hight quality or it will leach nickel in to you foods. If you touch a magnet to it and it doesn’t stick, it is cheap SS. This article and others on this site are good info about this. Also, the book called Radical Medicine By Dr. Louisa L Willams explains a lot of this as well. If the plastic doesn’t have BPA, I would not sweat it as much. Thanks for the info! We actually just found the mercola article today after other readers expressed concern about the aluminum. Looking into it! You said you are replacing your plastic funnels with metal ones, because of BPA. I am doing that too, and even found a glass one I LOVE! Do you have any concerns about aluminum in your baking sheets? There was a study showing an increase of aluminum in the brains of people with Alzheimer’s. I have stopped using deodorants that have aluminum and have tried replacing my pans…just curious about your thoughts on this. We’ve got an Amish General Store about 45minutes away from us and its one of our favorite Summer & Fall motorcycle ride destinations. We stock up on Rada cutlery, cheeses, beef sticks, bulk spices & nuts including roasted, seasoned pepitas, which are the green inner pumpkin seed, yum!. I also often pick up pie fillings, cook books, and different kitchen items that are difficult to find in our commercial world. Another place you might be able to find some of the items you’re looking for that you would find in an Amish store is http://www.lehmans.com/. They have the largest stock of manual tools and the Amish order from them often. As to the aluminum.. I agree with another commentor regarding the use of aluminum. However, you could use parchment paper to form a barrier between the aluminum & foods. I also do not use commercial deodorants for this reason. My sister died from breast cancer 3 years ago and I figure I’d rather be safe than sorry. I use generic Milk of Magnesia whos sole ingredients are magnesium hydroxide and water. You just swipe a little bit on & rub it around. Works better than anything else I’ve tried including coconut oil, but difficult to find right now since Wal Mart changed their formula to contain bleach. Sigh.. Enjoyed this post.. Have a great day! A little trick we use here at home to help our bar soaps last longer is to put them into a ladies knee high, we buy them for .33 a pair and use one till it’s in pieces, then use the next one, we tie a knot at the top with a loop so we can hang it when we’re done, it essentially makes for a “soap on a rope” style out of any bar soap. The soap lasts longer, lathers better (you get it wet then pull the material off the soap and when it comes back down it makes a zillion micro bubbles) and allows you to use every last fleck of the soap! We’ve been doing it this way for a couple years now….another added bonus, if you put the loop around your wrist while in the shower, you never drop the soap! So it’s safer too 🙂 Hope this helps! It does actually, but it’s not super rough or anything, as the soap conditions the material 😛 I just love that we get to use every sliver of soap instead of having to throw away “that pitiful broken piece” that inevitably washes down the drain when you drop it. Now, we just put a new bar on top of that little piece and it gets used all up too! Thanks to reader feedback we’re now looking into this Aluminum pan for safety and will report back. Y’all rock! I buy Amish goods from E&S Sales, 1265 N. St. Rd, Shipsawana, IN. 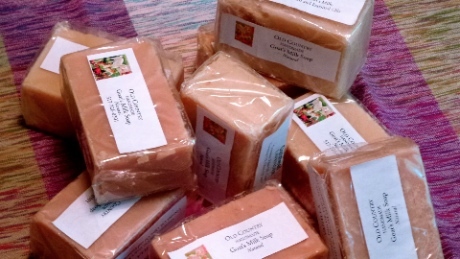 for unbelievable prices including $4 for a bag of 6 bars of homemade soap. I live in Florida and stock up when I visit my children in Michigan. I find other goodies there also, although I never know what I might find. I have purchased a wonderful cookbook, men’s hankies, spices, baking goods and bulk products including cinnamon chips I use for making bread – it’s wonderful! These are things that would cost so much more to mail order. I love the cover for the baking sheet, but aluminum? We have replaced all our aluminum baking pans with stainless steel and cookware with either stianless or cast iron. I’m so surprised you would buy/promote aluminum! I agree with Peggy! Aluminum has been linked to Alzheimers (sp?). The nesting set of funnels didn’t have a brand name on them, just a pricetag. 🙁 The stainless canning funnel is from Harold Import Co. Hope that helps a little! To the woman who lives in Michigan asking about spices, I use two stores, Milford Spice Company. They are excellent. And I also use Penzeys. I just can not recreate some of their spice blends. Very high quality. For Honey we use the Barber Family Honey out of Davisburg,MI. This is NOT liquid honey. It is raw unpasteurised. I can’t buy any other or my children will never forgive me. To the authors, heading north in a couple weekends and would love to know where you bought the maple syrup. This would provide all sorts of joy with our sourdough pancakes from fresh milled flour! Esther, the maple syrup was purchased at the Meridian Township Farmer’s Market. May 5 marks their first outdoor market of the year in the Central Park Pavilion in Okemos, MI. Look for the “Country Products” stand where you can get the gallons for $47. Thanks “Mom” :). Will definitely be planning a trip soon! Can’t wait! Hi Guys! I especially enjoyed this article since I can take the credit for leading Matt to the Amish general and bulk food stores where he made his remarkable purchases! 🙂 Both stores are located in a predominantly Amish community in Mio Michigan which is located on the junction of M-72 and M-33 in the mid eastern part of the lower peninsula. The bulk food store is on Kittles road, off M-33, I believe a mile or so northwest of town and the Pioneer General Store is right on M-33 a couple of miles north of town. Matt and I had a very good day together looking around the community and we also had an awesome burger platter courtesy of Paul, the proprietor, and his wife Beverly at Walkers Bar and Restaurant which is located in beautiful downtown Mio! A real must on any to do list during a visit to Mio. The town is also located on the AuSable River, close to Mio Pond and has great canoe/tubing/kayaking facilities! Have fun! Next time you are in the Mio area, go 9 miles north of Mio on M33 to Fairview, a nice little Mennonite community. Check out the Fairview Food Market! They have some of the most fantastic homemade meats! The meat guy, Mike, does some wonderful things to chicken, ribs, shoulder bacon, jerky and summer Okay…I am just a little bit biased since the store is owned and run by my 2 sons, Dan & Mike! LOL!!! The Amish stores in the area are wonderful and offer many unique items! Whoops didn’t realize that was going out to Everyone. I’ve been getting your ended letter for awhile now and just saw that u just moved to Hville! We just moved to Brevard! Don’t you just love it here!!!!! We do. My husband is the new ranger in the Pisgah Ranger district. We do a lot if hiking with our 3 boys. And we just bought a house that has an amazing garden I’m trying to learn what to do with! We should met up sometime. I’m an interior designer (well before kids and I hope to be again) and im always on the hunt for Eco design info and choices. That Ecologically safer and Economically friendly. Anyway, my question is about your aluminum pans: I’ve been coveting some to, but what about aluminum? A friend of mine avoids it like the plague. What’s your feeling. I’m in Michigan (Lansing area). Please tell me. Where is the Amish supply store and the other places you mentioned? Oh ya, I forgot to say that we too have been eliminating all the plastic and teflon from our kitchen and I have found a whole new way of cooking with glass and cast iron. These are incredible and if you are doing any research, you should definitely check them out. Lodge Logic brand is made in the USA and has been around for over 100 years. There are so many good things cast iron has to offer and definitely something you guys should look into. They are even more efficient because of their ability to retain heat. I love my first purchase and will definitely be adding more! Thanks so much for this post! I currently live in Michigan and have been looking for a resource for raw honey. $17 is an incredible price! I would love to have the address or location of the farmers market! I’m not sure where in Western NC you guys live but hubby & I just bought some property in NE Tennessee and are starting to plan for our retirement there. I am so looking forward to starting a mini-farm there and am so excited to finally have the space required to grow and raise the majority of the food we will eat. Of course our plan requires a few more years before we can actually relocate but I can’t wait to get some fruit trees, berries, and perhaps grapes started! Anyhow how cool to think that we might actually be neighbors someday! The 6# bucket of raw honey was purchased from Country Corner Bulk Foods on Kittle Rd. in Mio, MI. Good luck getting your TN farm started…that sounds awesome! Where do you go in Michigan to shop for things like that? I’m trying to revamp a lot of things like this in our home, but having a hard time finding reasonably priced places to shop! Our favorite Amish farmer, Wilbur Hochstetler, is from Charlotte, MI and sells his wares at the Holt Farmer’s Market (Holt, MI) and the Meridian Township Farmer’s Market (Okemos, MI). The Amish bulk store is Country Corner Bulk Foods on Kittle Rd. in Mio, MI. Good luck! I have great news for you. If you do a Google search, you will find a couple of Amish stores in Western N.C. One that I frequent is outside of Wilkesboro, N.C. (off 441 near I-77) out in the country called Shiloh General Store. When I googled, I found a couple of others that might be near where you live! Hope you get to find them. Also, did you know that the natural medical people say it isn’t good to cook on aluminum? ( You mentioned your new baking sheets) They suspect it to be a cause of Alzheimer’s. I am sensitive to this because my Dad had Alzheimer’s, so I am careful not to use aluminum in baking powder and antiperspirant; I also got rid of my pressure cooker which is aluminum. Thank you for your emails. I love them! Love your post. I live in Michigan and would love to know where you found the bulk foods, especially the spices. Thanks! The indoor Farmer’s Market we visit is in Okemos, MI at the Meridian Mall. This is where our friend Wilbur sells the good maple syrup, soap, and tons of other things we love. The spices, cheese, honey, and kitchen tools featured in this article were purchased at Country Corner Bulk Foods on Kittle Rd. in Mio, MI. Hope you’re close enough to hit up one or the other! I live about 30 miles from Mio and was excited to hear that you’d been in my neck of the woods. I was excited to find your page after deciding to try and steer my family into a more healthy direction. So many things to try! Hey! Good morning! I live in North Carolina. I of course do not know what part of western NC you are in, but, I wanted to tell you about my favorite Amish store. It is the Shiloh General Store in Hamptonville, NC. Check it out on the internet to see if it is near you!